All wishlists can be managed by admins and shop managers. You can change wishlist information, delete wishlists and change products inside of lists. 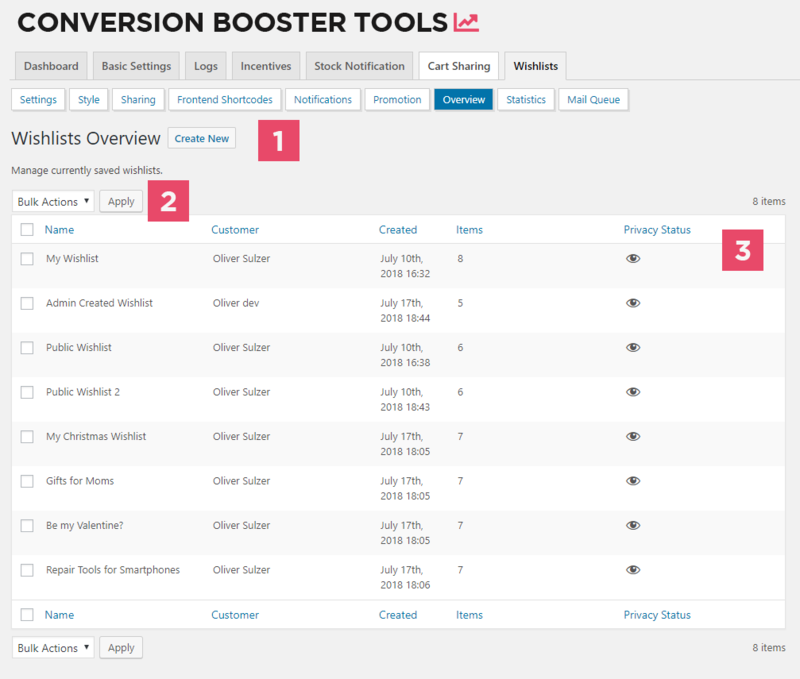 Its also possible to create new wishlists and assign them directly to a customer. This button forwards you to the creation of a new wishlist. Inside of the editor you can then select a title, a descriptions, the privacy and assign the wishlist to a customer. You can bulk delete many wishlists at once. The wishlist table shows you basic information about the currently saved lists. You see how many items are in a list, what the privacy setting is and when the particular list was created. Each wishlist can also be edited by hovering over the entry and clicking on the „edit“ button. This table displays all the products currently found inside of the wishlist. You can choose to delete products or change quantities. Use this form to add new products to the wishlist. The form supports variable products as shown in the picture above. To add the selected product to the wishlist you need to click on the „Add to Wishlist“ Button. The two buttons at the end of the form allow you to either save the current wishlist or delete it. The save button saved all information currently changed. It also takes the currently defined quantities into consideration. While creating a new wishlist you first have to select a customer that new list should be assigned to. You can use the input field to search for users. The field accepts wildcards like „*“ so you can do a quicker search by typing only a few characters. A name for the wishlist is required, the description field can be left empty if you so desire. The privacy setting defines who can see the wishlist. 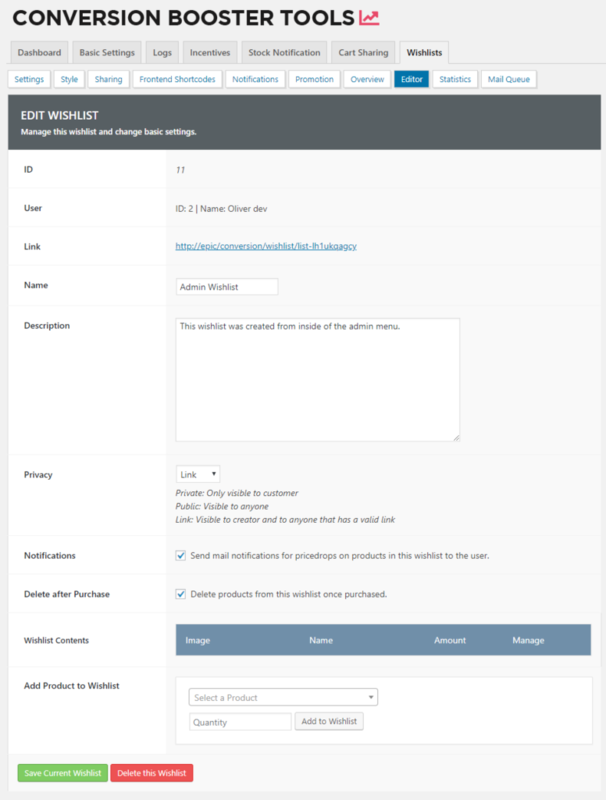 The form also allows you the set settings for notifications like price drops or special promotions and wehter products should automatically be deleted from the list once the customer purchases them. You can start to fill the new wishlist by clicking on the „Continue“ button. 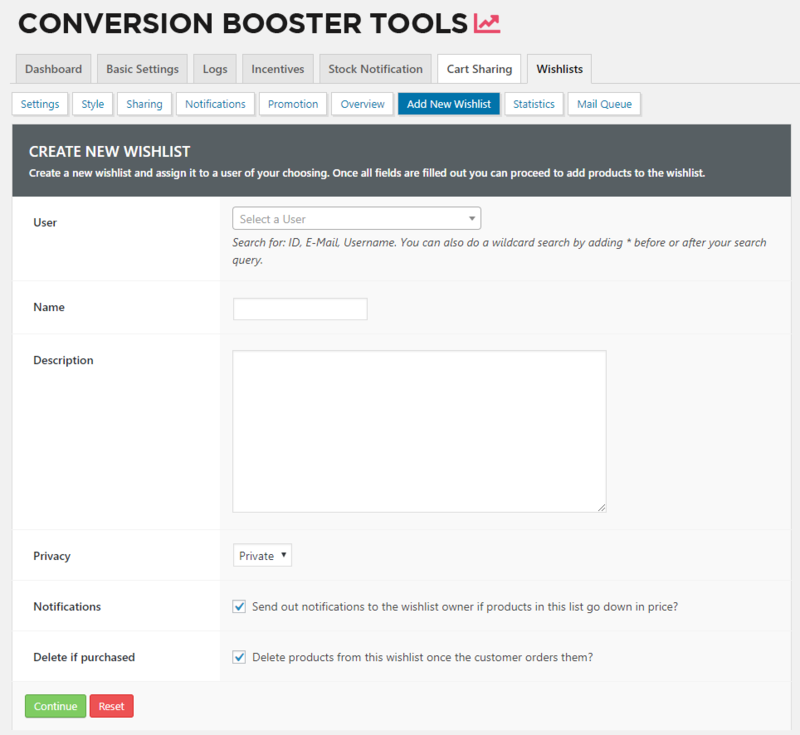 After clicking on „Continue“ you will be presented with the basic wishlist editor through which you can add products to the wishlist.